Saturday evening sees the final mass at St James, Lakewood in the Diocese of Cleveland. The diocese decided to close this parish and as many as 50 other parishes as part of austerity measures in response to clergy and financial shortages. This particular case highlights many of the architectural factors and impacts in parish closures. The closure, consolidation or reorganization of parishes is a difficult and complex issue facing the churches of the American Midwest. It is rarely, if ever, a happy circumstance for those involved in an episcopal church when necessity and politics seen from above clash with community identity and continuity seen from below. Though bishops may be charged with insensitivity in the details of handling of parish closures, as is true in the case in question, I doubt anyone in the church takes pleasure in these events. Like so many necessary and potentially edifying internal church conflicts, it becomes a matter of how well decisions are handled in a bad situation. A wide range of issue factor into the process of discernment on this issue: clergy appointments and shortages, disrupted service to the community, differing expressions of worship, political boundaries and structures, neighborhood or city identity, schools to close or move, financial troubles, lost staff, and so on. I do not wish to downplay these issues, for many of those of the church body are more critical than the church building; however, insomuch as the church building is the physical and more enduring constructed sign of the Body of Christ, its demise allows further reflection on the loss of the community. The immediate architectural risk with the closure of a parish is the potential loss of a significant structure. You might expect that a Midwest parish at risk of closure would not be in possession of an architectural masterwork; however, in the case of St James, Lakewood they certainly do have one of the finest church buildings in the country (read a description of the building and view more photos here on Locus Iste). But even when this is not the case, there are greater (if more localized) impacts on the built environment. The loss of the church's physical presence in the city reflects the loss of the church's active presence. What is more, abandoned, ruined or redeveloped church buildings project a public image of a church defeated. And for the church's members, the loss of a building is also a loss of memory and continuity. Artifacts reinforce memories of family histories (just read some of the comments on this and the other articles linked here). The loss of a space filled with the residue of past worship severely degrades the continuity and significance of our present worship. St James, Lakewood is a particularly interesting example of these impacts on the built environment not only because of the loss of a significant structure, but because it also raises issues of building preservation, the separation of church and state, the redevelopment of former churches, and the perceived conflict between liturgical practice or parish identity and their building's style or arrangement. When it was clear that the parish would be closed, the city of Lakewood designated as historical the interior and exterior of the church building. A few commenters on these news stories have raised the question whether this violates the separation of church and state. The city carefully wrote the ordinance protecting the building to exclude "Portions of the church interior with religious significance," but this is not a simple distinction to make. What portion of the church could be considered without religious significance? A cruciform basilica with an apse has never, to my knowledge, had any other significance. The action of the city government ensures the survival of the building, but not of the parish. There is a substantial difference between keeping the building as an historic landmark and keeping it as an active parish. And this action also requires that the diocese continue to maintain the building, the primary expense that appears to have dictated the decision to close this church over the other two. It is worth mentioning here that the circumstances of its selection for closure are strange. The diocese asked clusters of church to recommend which of their churches would be closed. In Lakewood it came down to an impasse as to which of three churches - St Clement, SS Cyril and Methodius, and St James - would close. St James is the oldest of the three and the most attended. According to the Lakewood Observer, the fiscal year ending in 2009 saw 637 new parishioners join the church which had the "most Baptisms, First Communions, Confirmations, and marriages" in the city. and of course the building itself is an irreplaceable asset in comparison to the other churches. I cannot vouch for any of the politics behind the scenes in the decision-making process, but there must have been some since this seems like an odd choice for the one to close. And the internet is ripe with speculation. There are two explanations evident from what I have seen. The first is financial, and it is the building itself that is the cause of the burden. The 85 year old structure surely has the maintenance bill to be expected at such a venerable age. The roof alone required substantial work; there are reports of estimates from $200,000 to $1.5 million. But between the announcement and the enactment of the closure, more than $200,000 of repair work had been started. Again, strange. The second possible reason comes back to a much deeper issue concerning the relevance of "traditional" architectural styles and a perceived conflict between liturgical practice or parish identity and their building's style or arrangement. Comments by a former organist from the parish and the organist from a nearby church suggest discord between the preferred styles of the leadership, various parts of the congregation, the musicians and the building. Which brings us to an entirely different set of issues that cannot be fully addressed here. These are the issues this site was primarily started to address: what are the interfaces between the liturgy, with its diverse wealth and continuity of expressions, and its architecture? and based on the meanings of those intersections, how now do we build and pray? In this case, the questions run like this. Does a traditional church demand traditional music and liturgical settings? If so, how far does that go? Is it enough to use an organ instead of a guitar? Is the Gregorian chant prerequisite for Latin Rite liturgy or do you need to match Sicilian Romanesque practice with this Sicilian Romanesque building? Not to mention the question of translations. My suspicion is that for most people, the use of the organ is sufficient for the simple fact that it "sounds old," an answer which might be masked with theological trappings but is in fact about individual perception and experience and therefore insufficient. To all of which the building laughs somberly. Or maybe sighs. Look closely and this should be an equally challenging building to the traditionalist and modernist camps alike. 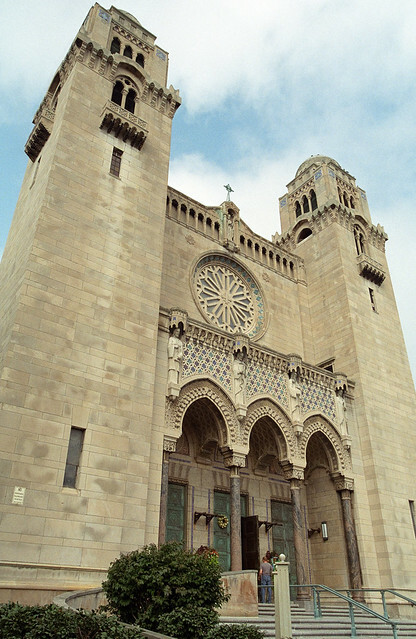 Yes, it is Sicilian (or Norman) Romanesque, but the exterior towers are Deco, cutting edge for 1925 suburban Cleveland. Abstract geometric patterns dominate the interior, but it is not the abstract of modern art. It is the abstract of Saracen tradition carried through Sicily. The incredible clerestory frescoes, a traditional element of church ornament depicting biblical scenes and saints, reveal an inspiration from ukiyo-e and the late 19th and early 20th century Japanese printmaking in Western art. 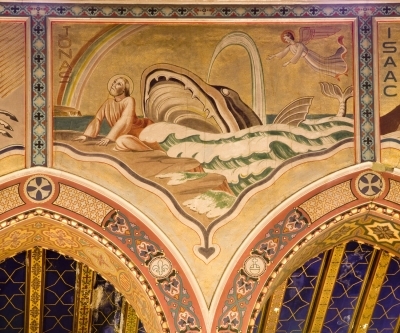 Not to mention the almost Jugendstil angels on either side of the apse. And despite these disparate influences in a quintessential Romanesque basilica, it works. So it is not only significant for its being, according to R.F. Webber, author of Church Symbolism (1938), "one of the best examples of church art ... in the entire country" because of its "comprehensive scheme of symbolic decoration" but for its ability to be comprehensive by embodying a storied diversity of the church universal. And it deserves (without demanding) a complementary approach to the liturgical celebrations. Such a building must be allowed to live, not just remain, well beyond its 85 years.